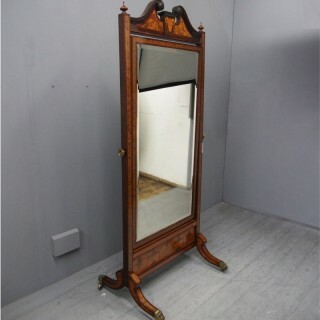 Circa 1890, late Victorian inlaid satinwood and mahogany cheval mirror. Surmounted by a swan-neck pediment with carved rosettes over an inlaid frieze with foliate and Neoclassical inlay. 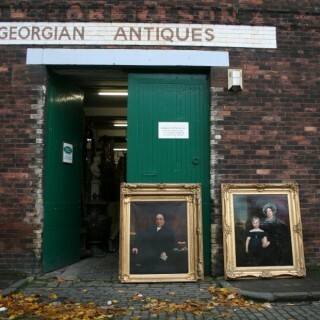 The bevelled edge mirror is in excellent condition and in an inlaid frame with satinwood bellflower pendants, all supported on conforming inlaid pillars. It is over a stretcher with urn and foliate inlay and leads on to hipped cabriole legs with original brass claw castors. Size 190 cm high x 77 cm wide x 50 cm deep.